Iceland , also called the Republic of Iceland, is a Nordic island country between the North Atlantic and the Arctic Ocean. Iceland is a geologically young landscape due to its location on the Mid-Atlantic Ridge between the Eurasian and North American tectonic plates. The island is therefore highly volcanically and geologically active. The currency of Iceland is the Icelandic króna. Reykjavik which means ‘smoky bay’ is the capital city of the Republic of Iceland with 184,000 inhabitants. Iceland has some unique natural features such as ice cap mountains, volcanoes, hot springs, waterfalls, glaciers, geysers and ancient cooled lava flows. There is a volcanic eruption every 4 years on average. Hekla is Iceland’s most active volcano, Hekla is also a common female name in Iceland. Vatnajokull glacier in Southeast Iceland is Europe’s largest glacier. Sometimes called Crystal Caves, the ice caves in Icelandic glaciers are a truly mesmerizing wonder of nature. Iceland has 20 active volcanoes. The most active are Hekla and Grimsvoetn. Geysir sometimes known as The Great Geysir, is a geyser in southwestern Iceland. It was the first geyser described in a printed source and the first known to modern Europeans.The English word geyser derives from Geysir. The Icelandic tradition of bathing outdoors in volcanically heated pools dates right back to Viking times. Gullfoss is a waterfall located in the canyon of Hvítá river in southwest Iceland.Gullfoss is also one of the most popular tourist attractions in Iceland. The energy of the Iceland volcanoes and vents is used by geothermal power stations and supplies the heating to around 85% of all households. The first people to live on Iceland are thought to have been Irish monks around the year AD 800. In the 9th century, Norsemen arrived in Iceland. The only native land mammal when humans arrived was the Arctic fox. Wild mammals in Iceland include the Arctic fox, mink, mice, rats, rabbits and reindeer. Eaten regularly as a snack or with meals, the dairy product Skyr is one of the most popular foods in Iceland. 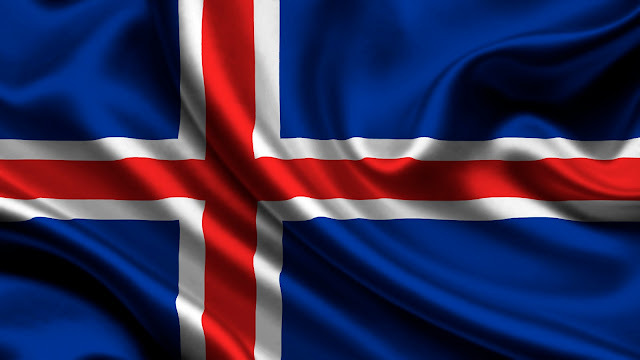 The three colors of Iceland’s flag represent elements that make up the island. Red represents the island’s volcanic fires. White is for the snow and ice fields and blue the ocean. Iceland has ranked number one consistently as the world’s most peaceful country and has the lowest score in the Global Peace Index measure. Iceland is home to one of the world’s oldest democracies, established in 930. Iceland’s revenue from whale watching exceeds any income from whaling. Poll results achieved over an extended period of time make it apparent that a majority of citizens of Iceland believe in the existence of elves. The Icelandic language remains unchanged from ancient Norse. That means 1,000-year-old texts are still easily read. During the months of June and July, Iceland has days with a full 24 hours of precious, beautiful sunlight. Some people in Iceland look at it as a splendid time to catch up on their golf at midnight sun. Northern Lights or Aurora Borealis can be seen during mid-winter (November-December) when the weather is clear. In 1980, Iceland became the first country to elect a women president. Vigdís Finnbogadóttir was president until 1996. This nation boasts the highest number of artists and authors per capita. The last name of Icelanders is derived from their father’s first name. In Iceland owning a pet snake, lizard or turtle is against the law. Raw puffin heart is considered a delicacy. Icelanders watch more movies than any other nation. Consumption of Coca–Cola per capita is higher than in any other country.